Daniel Defoe described Bury St. Edmunds as the Montpellier of Suffolk and it is certainly a pleasant place to spend a day or two. 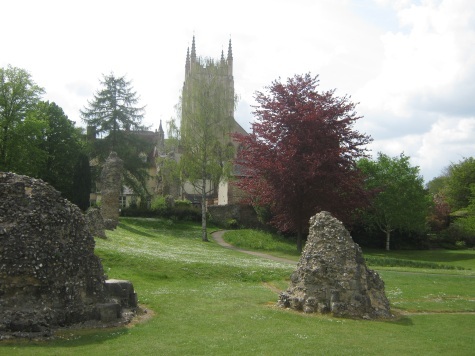 The ancient site of the Abbey of St. Edmund is the very heart of the town which grew around it. King Sigebert founded a monastery here around 633 A.D. and this became the official burial place of St. Edmund in 903 A.D. 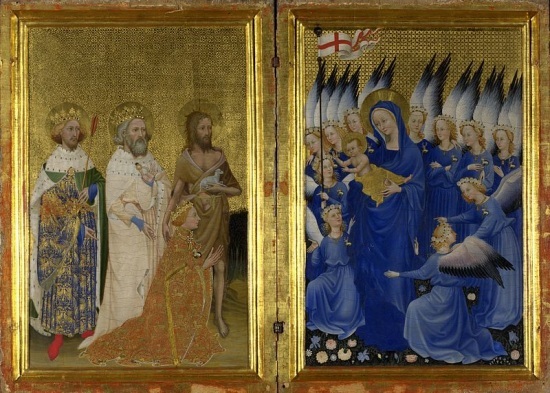 The beautiful 14th Century Wilton Diptych, in London's National Gallery, portrays King St. Edmund with King St. Edward the Confessor, King Richard II and St. John the Baptist paying honour to the Blessed Virgin and Child. Several decades prior to his burial in the abbey, St. Edmund had been martyred by Danish invaders in 869 A.D. Abbo of Fleury recorded that St. Dunstan had received the account of his martyrdom from St. Edmund's sword-bearer. The saint had refused to deny Christ as his Saviour when challenged by the Viking Hinguar. 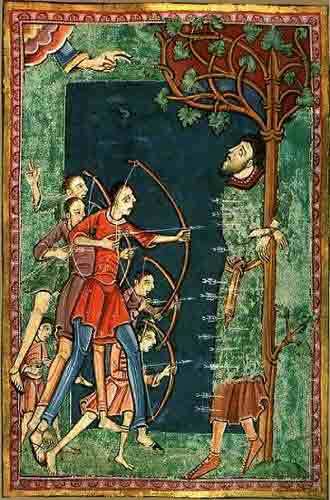 St. Edmund was thus scourged, shot with many arrows and finally beheaded. He is a great saint to pray to in our times when Catholics are tempted and pressured to deny Christ and His Church in countless ways. 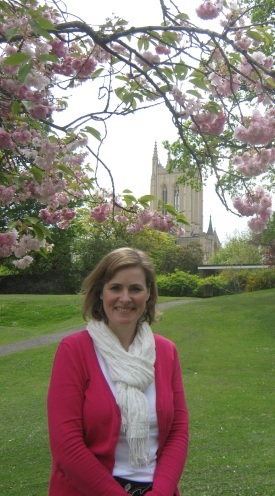 It is worth reading Jocelin of Brakelond's Chronicle of the Abbey of Bury St. Edmunds 1173 - 1202 in order to grasp just how deeply the abbey and town understood themselves as belonging to St. Edmund. When the abbot and his monks stood up for the rights of the abbey they saw themselves as defenders of the rights of the saint himself. 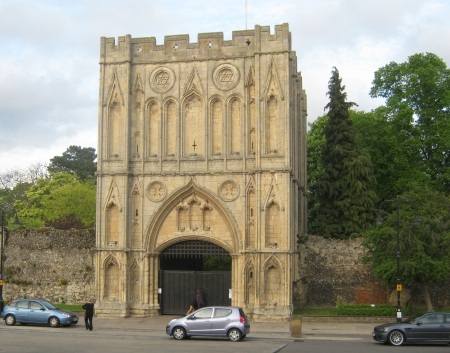 Indeed, King St. Edward the Confessor established the Liberty of St. Edmund as a seperate jurisdiction under the abbot of Bury St. Edmunds Abbey; an arrangement which lasted until the Henrician Dissolution of the Monasteries. 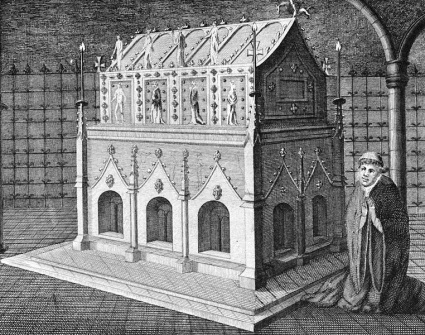 This depth of unity and power was preserved in no small part because of the presence of the relics of the saint himself in the shrine at the heart of the abbey near to the High Altar. Various kings came to pay homage and to pray here; including Canute who rebuilt the abbey and offered his crown to the shrine in reparation for the sins of his forefathers. 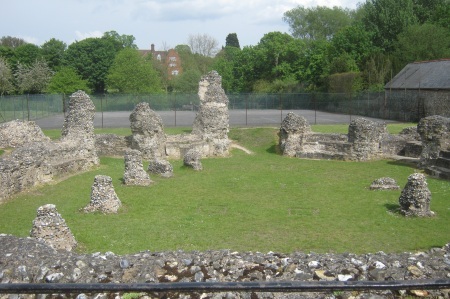 St. Edmund's Abbey became one of the most famous and thus wealthiest pilgrim sites in medieval England. St. Edmund's relics were miraculous from the beginning and - centuries after his death - his body was found to be incorrupt with soft, fresh skin and his head found to be reattached with a line around his neck. Sadly, everything was swept away at the Dissolution of the Monasteries from 1539. The next photograph below shows the remains of the Presbytery where the High Altar was once surrounded by an ambulatory of smaller chapels. We prayed here for the 4 main intentions of our pilgrimage (mentioned in the last blog/news post). The original 14th Century Abbeygate and 12th Century Norman Tower are still standing on the main street and present a tantalising glimpse into how things once were. Opposite the Abbeygate there is also a marvellous little tea-shop where visitors can sit and watch the world go by. A few years ago, Elton John disparagingly questioned whether Christianity had contributed anything positive to society. 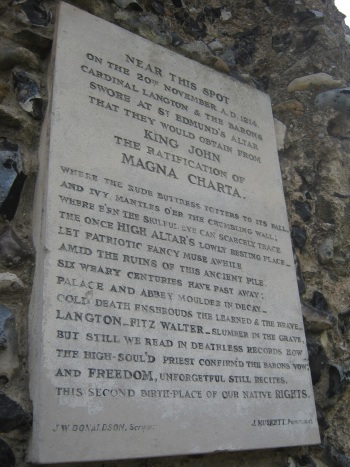 The photograph below shows a monument in the abbey grounds which might provide him with some food for thought. Come to think of it, it might provide us Catholics with some too as we witness our nation turning its back on God, His Church, the Natural and Divine Law, and the traditional freedoms which they bequeathed to Western Civilization. St. Edmund the Martyr King - Pray for Us!